AMD’s path to this moment was a difficult one. The company spent $334 million to acquire SeaMicro, an investment which was latter written off completely, and ultimately lead to shutting down the micro-server division. At the same time, 2012 saw the announcement of ARM-based Opteron and its arrival on the product roadmap (and a continuous push back), with ARM-based AMD product being available only as a single processor, 1U half-rack development kit from a third party vendor. This changes today, with the introduction of AMD Opteron A1100 Series processors, based on a silicon codenamed ‘Seattle’ – which may or may not have to do anything with two major customers from that area. In order to bring ARM-based Opteron to market, AMD teamed up with Calxeda / Silver Lining Systems, a company that acquired Calxeda’s IP. When Calxeda failed to come to market after running out of funding, all-Calxeda based projects, including this one ended up being severely delayed or canceled. After all, Opteron A1100 or ‘Seattle’ was supposed to launch in 2014. Still, regardless of that failure, seeds were sown as the market started demanding ARM-based servers, regardless of what the dominating 800-pound ‘x86’ gorilla wanted them to order/buy. 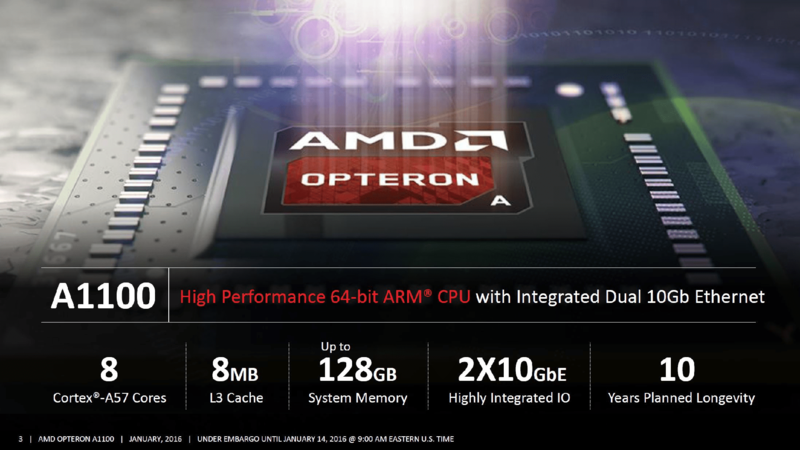 AMD Opteron A1100 processor overview. 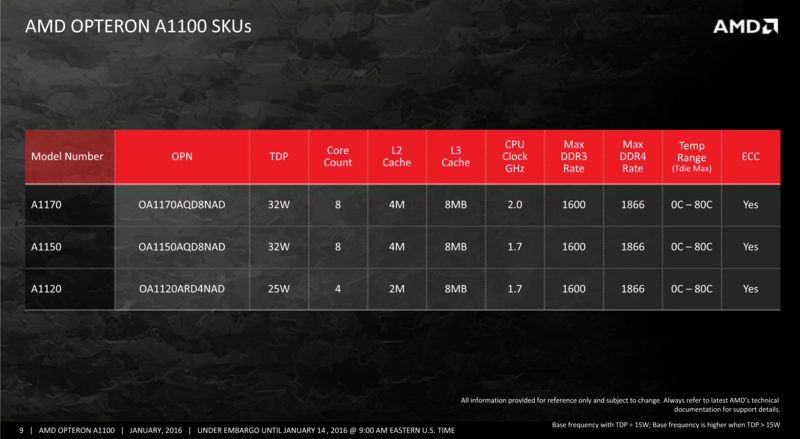 AMD started to develop 64-bit ARM core and codenamed the core ‘K12’ and implemented Calxeda’s / Silver Lining Systems fabric to use a fast and efficient interconnect that connects eight ARM cores with two 10GbE controllers inside this compact A1100 SoC. The dual 10GbE controllers are named Fabric Interconnect Adapter, or FIA – and two FIA-2100s are a part of each and every A1100 processor. What makes this combination interesting is that each FIA-2100 comes with 60Gbps of bandwidth (7.5GB/s). Given that interconnect and networking is the most important aspect of an ARM-based server, it is good to see that Calxeda’s technology keeps on living with another innovative company, such as AMD. Besides Calxeda’s networking fabric, AMD’s take on ARM cores through K12 and Cortex-A57 are very interesting and if you followed AMD’s x86 product lineup, similarities are unmissable. For performance purposes, AMD K12 brings support for L3 cache, which is not something we see on regular mobile-focused ARM chips. Sadly, as the time went by, K12 slipped and today we have licensed Cortex-A57 cores. The question is AMD going to have its own ARM architecture or not will probably get an answer in 2017 or 2018, but bear in mind today is the launch of a product announced three and half years ago, and was supposed to launch two years ago. Two ARM Cortex-A57 cores are paired with 1MB of L2 cache, and share access to 8MB of L3 cache with other cores. In a way, this approach to processing architecture is all but identical to AMD’s x86-64 lineup, both the consumer ‘FX’ and enterprise ‘Opteron’ processors. A1100 supports enterprise-grade ECC memory in both shapes and forms; DDR3-1600 and DDR4-1866. AMD’s Opteron A1100 family consists out of three products; A1120, A1150 and A1170. All are based on the single die, with the A1120 having a lot of die disabled for yield and performance purposes. As you can see on the table above, A1120 represents a pretty interesting product with a lot of L3 cache at its disposal. If the data set your application uses doesn’t fit in 512KB L2 and let’s say 2MB of L3 cache, your single thread can capture the 1MB L2 + 8MB L3, and that is something high-resolution, high-bandwidth video applications might require. After all, on every smartphone user there is a datacenter that has to sort all the data before it gets delivered on your mobile device, and by putting the ARM core and Linux operating system on the server side, the time of big iron cores to address the numerous users might be a thing of the past. At least, that’s what AMD is gambling on. The company is launching the ARM-based processors for low-power, numerous users case scenarios, while 2017 will see the debut of 200 Watt monsters which pair thousands of GPU cores with as much as 32 CPU cores, all based on the Polaris GPU and Zen CPU micro-architectures. The question is how fast can AMD prepare and launch many-core ARM-based processors, since Qualcomm plans to come to the market with a 24-core server processor. All in all, AMD is heading for a good start in 2016, and the decision to spin off the technology into Radeon Technology Group, including the enterprise-grade Opteron family is finally the arrival of fusion and more efficient corporate organization. Finally shipping products that stretched both engineering and financial resources should be a sign of relief for AMD employees, fans and investors. It will be interesting to see just how much traction in hyper-scale server space can AMD get, or will the company known for its innovative and often market- and performance-leading products once more end being surpassed by their competitors? Theo, you had a good weekend I see 😀 K12 is 2017 product earliest. No, the article title is clickbait BS. Seattle isn’t based on K12.